Mindfulness. How to do it. Mindfulness is not a quick fix, you cannot teach it to young people unless you’ve experienced the benefits yourself, just as you wouldn’t teach anybody to swim if you’d never been in the pool. Our curriculum content can be adapted to suit any school or educational setting and reflect its particular needs. 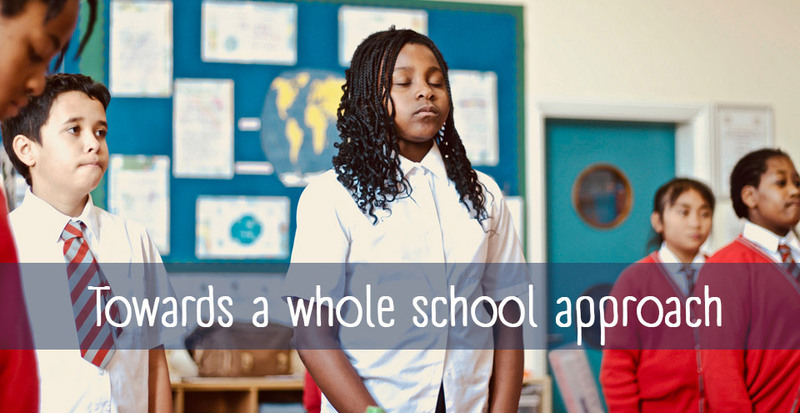 Many of the schools in our network started with a single trained teacher, delivering mindfulness to a single class or pilot group. Once a school has a trained teacher, that person can use our materials to teach class after class. But we frequently find that, through its success and popularity, schools quickly grow their mindfulness curriculum to cascade through year groups and fully embed within their school’s culture. We offer a free 30-minute live Information Webinar to support anyone interested in finding out more about mindfulness. Find out more here. Combining the convenience of a live online course with the intimacy of face-to-face delivery our .begin course introduces you to mindfulness through weekly online group sessions led by a MiSP instructor. .b Foundations – an eight-week course delivered on site by an independent MiSP-trained teacher to a group of at least 12 staff. This option is suitable for schools who have a sufficient number of interested staff to make an in-house course viable and who are able to find a local mindfulness teacher who is available. As part of the MiSP community you will have access to expert guidance and support as you continue to practice mindfulness as part of your everyday life. We ask that you continue your practice for a further 2-3 months (depending on previous mindfulness experience) after your eight-week course and before starting a Teach course. This is because we believe that teachers of mindfulness need to be able to model what they are teaching, and to understand and relate directly to experiences their students may be having. Once you have developed a regular mindfulness practice you are ready to train to teach either Paws b (for 7-11 year olds) or .b (for 11 to 18 year olds). Our Teach Paws b and Teach .b courses consist of real-time lessons, explanations of the pedagogy and time to practise guiding the exercises. At the end of the course, participants will receive six-months free membership to The Hub our exclusive teachers’ network and all the materials needed to start teaching the lessons.